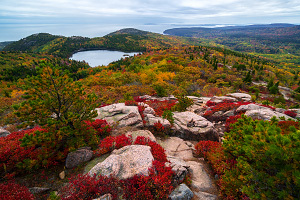 While the Precipice Trail is the most thrilling way to hike to the top of Champlain Mountain, the Champlain Mountain South Ridge Trail also offers hikers some amazing views, but without the need for any exposed scrambling. Starting from the Beehive pantheon near Sand Beach, the trail loops around The Bowl and then heads up the south ridge of Champlain Mountain offering wonderful views of The Bowl and the Atlantic Ocean in the distance. This hike is fun to do in its own right or in conjunction with the Beehive Trail or Precipice Trail. Access: Beehive Trailhead near Sand Beach. Time Required: 2-4 hours (round trip). Elevation Change: 1000-ft gradual ascent to top of Champlain Mountain. The hike starts at the Bowl Trailhead just across from the popular Sand Beach along the Park Loop Road. Park in the Sand Beach parking lot or in the right lane of the road as permitted. The whole Sand Beach area is very popular, so be prepared to hunt for parking, utilize the free Island Explorer Shuttle Busses, or get an early start. Begin hiking the Bowl Trail as it makes its way through the lush forest under the Beehive. 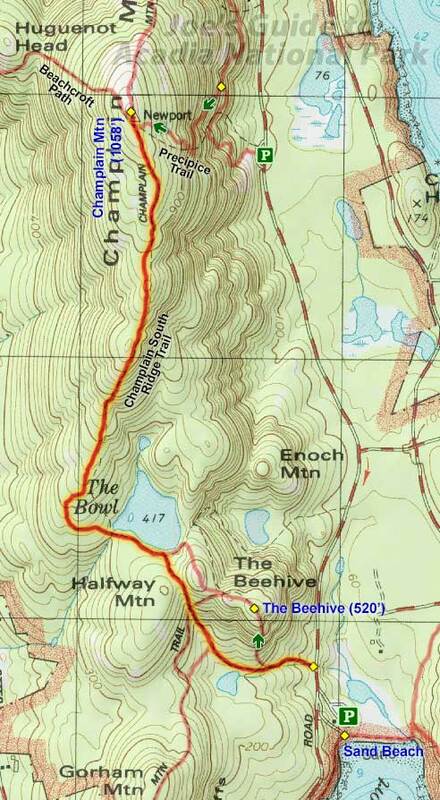 You will pass the junctions for the thrilling Beehive Trail on your right (north) and soon after, two spurs to the Gorham Mountain Trail on the left (south). The Bowl Trail ends at the shore of The Bowl, a beautiful glacier-carved pond wedged between the Beehive and Champlain Mountain. At the lakeside trail junction is the start of the Champlain South Ridge Trail. Follow the planked trail west as it works its way around the south side of The Bowl. Soon enough, the trail turns north and starts its smooth and steady ascent up the beautiful granite formations of Champlain Mountain. As you gain elevation, be sure to look to the south for some really terrific views of The Bowl and the Atlantic Ocean. Dorr and Cadillac Mountains can also be seen to the west. While the hike is mostly a gradual ascent, there is a bit of scrambling under the final ridge. But once near the top, the trail levels out and soon enough you will be standing at the summit marker and junction with Champlain Mountain's other trails: the Precipice Trail, Beachcroft Trail, and the Champlain North Ridge Trail. 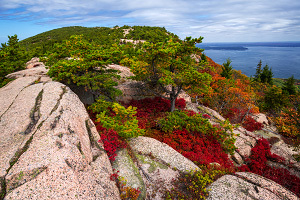 The Champlain South Ridge Trail is another one of Acadia's beautiful hikes and it's especially photogenic in the fall when the blueberry leaves have turned red. For those looking for a longer hike, it is fun to do the Beehive Trail and then continue up the Champlain South Ridge Trail. The Champlain South Ridge Trail also makes a good continuation after hiking the Precipice Trail if you have a means for a pickup or a carspot.